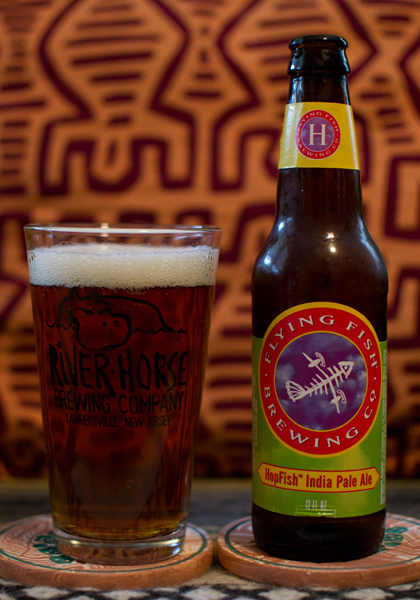 Beer #264 is Hopfish India Pale Ale by Flying Fish Brewing Company from my home state of New Jersey. 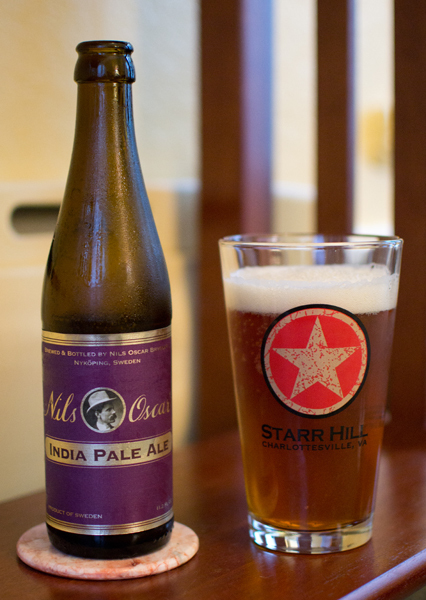 This English India Pale Ale with an ABV of 6.7% is brewed in Cherry Hill. Hopfish poured with an yellowish amber color with a nice off white head that dissipated very quickly. It had a nice light floral hoppy aroma. There was a kind of fruitiness going in there also. The caramel of the malts stuck out more in the taste then the hops. Towards the back end there was a pine like flavor. I didn’t get any fruit like flavor in the taste like I did in the nose. It had a lighter than medium body with lower amounts of carbonation. It was sort of smooth and didn’t have much of a bitterness to it. It was quite an easy drinker. Fairly run of the mill brew. 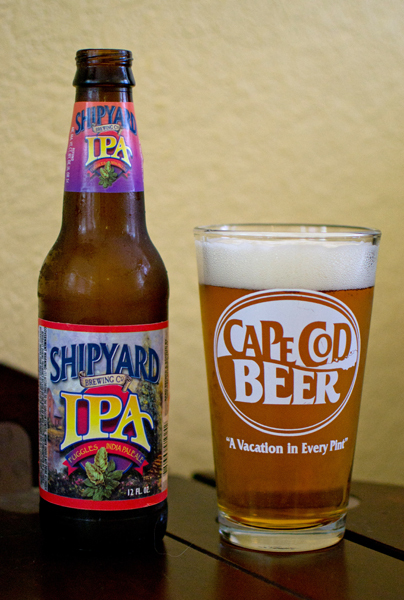 I still prefer American IPAs over their British counterparts mostly for their bigger, bolder hop profiles. I heard that the NFL just may settle this little lock-out thing they have going this week. Thank goodness for I can’t picture the fall with out football and my beloved Dallas Cowboys. I could debate for hours on “Tony Romo, can he lead us to and actually win a Super Bowl?” with fellow Cowboys fans forever. I think he could but only time will tell. So to celebrate, I broke out my Cowboys pint glass I picked up down in Dallas when I toured the now defunct, Texas Stadium. 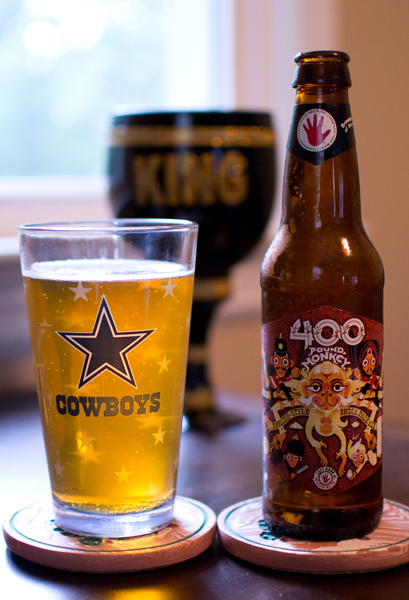 Beer #232, 400 Pound Monkey by Left Hand Brewing Company from Longmont, Colorado, went into that Cowboys pint glass and it had a clear golden color with just a tiny ring of a white head. This English IPA with an ABV of 6.7%, had a very light nose of toasted bread…and that was it. It had a bread like flavor with a bit of a pine mingling in there. It had a kind of clean sweetness bringing up the rear with a touch of bitterness. My wife brought me in some pretzel chips as I was tasting this and they mixed together rather well. The body was medium with a decent amount of carbonation that had this bordering on being almost creamy. This was a pretty decent beer that I think would go well munching on some salty snacks watching football on a Sunday afternoon. I know it is a bit early…but…go Cowboys!!! I have absolutely nothing to say today. 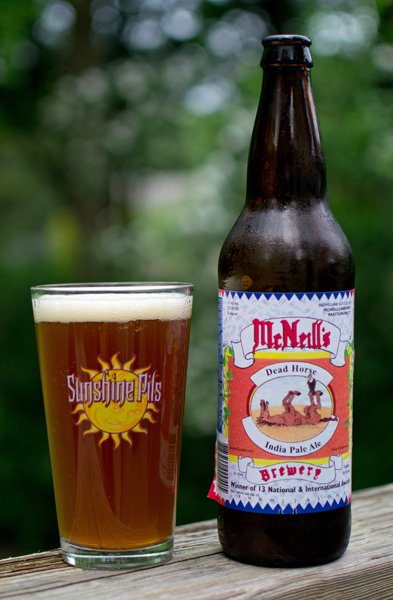 Beer #189 is McNeill’s Dead Horse India Pale Ale by McNeill’s Brewery from Brattleboro, Vermont. Rain rain go away come on back another day. And that means you too Mr. Tornado. Tornado warnings here in NJ today…crazy. I bet they don’t have tornadoes in Sweden. Sweden you ask? Well I mention Sweden because beer #151 is from that exact country. Nils Oscar India Pale Ale by Nils Oscar Bryggeri is an English IPA with an ABV of 5.3%. This is my first beer from Sweden…cool! A cloudy amber was the color of this brew except for the off white kind of fluffy head. The nose was quite different from American IPA’s…it was much more malty smelling (caramel) with the hops (pine) taking a huge backseat to the malt. The taste is mostly dominated by the sort of sweet caramel malts but near the end comes that familiar pine hoppy bitterness, flavor, and bite. The hops in the taste are very much toned down compared to American IPA’s. It had a medium-heavy body with a kind of sticky mouth coating feel. The carbonation was on the low side. Quite drinkable if you don’t enjoy very hoppy and bitter brews. This is a pretty good brew indeed. It wasn’t what I was expecting when I saw IPA on the label but it still was enjoyable to drink. Felt like I brought the Florida weather back to NJ with me today…it was gorgeous out…much warmer temps than there should be for this early in the spring. I took beer #134 outside for a pose today. 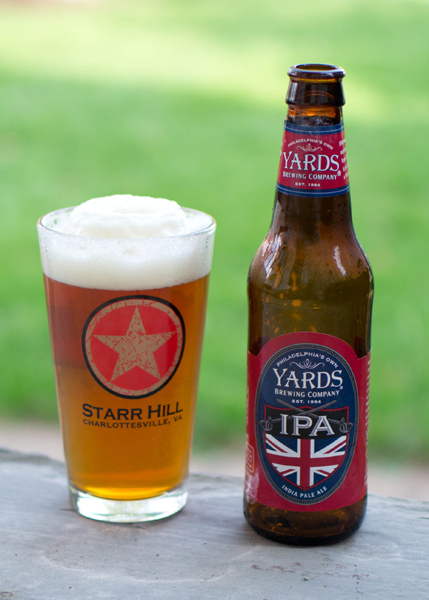 That beer is India Pale Ale by Yards Brewing Company who hails from Philadelphia, Pennsylvania. This beer is brewed in the style of an English IPA. It has an ABV of 7%. It poured a light amber with a huge off-white head that bubbled over the top of the glass. The aroma was mild. Mild grapefruit, mild malts, mild everything in the nose. There was a fruity (not grapefruit or citrus), almost clean aspect to the nose that I wasn’t expecting. I couldn’t exactly put my finger on what that fruity aroma was…odd. It was very different from an American IPA in that I didn’t get the really recognizable aromas of pine. The taste was malts up front followed by yellow grapefruit finishing up slightly bitter. The malts were much more apparent in the taste with the grapefruit taking a back seat. A nice medium body with a nice amount of carbonation make up a beer with a nice mouthfeel. This was quite drinkable for me. Pretty darn good English IPA. This makes up for the Poor Richard’s Tavern Spruce Ale I had back at beer#8. As I’m finding out with this blog, Pennsylvania has some really good craft breweries…much better than New Jersey…and that makes me sad but happy too as I live close enough to Pennsylvania to be able to enjoy those beers. Today is a milestone…this will be my 100th beer since starting this back in November. I actually didn’t think I would make it this far and once or twice almost decided to stop but always decided against it. The main reason I have wanted to quit is the blogging. That can get tedious at times. The actual drinking is the easy part and I truly enjoy getting the chance to try beers from all around the world…good or bad. I have also compiled spreadsheets of data and stats on each beer so I remember each one I have had so I don’t repeat. For the stat junkies out there, in the first 100 beers, I have spent $443.02 with the average price being $4.57 a beer. As I rate them I also give them a number score and keep that score in a spreadsheet. The system is as follows: A+=5, A=4, B+=3.5, B=3, C=2, D=1, F=0. Going by that in the first 100 beers the average rating is 3.04 or just over a B. There have only been 3 F’s but on the plus side, 12 A+’s. One other interesting fact, at least to me, is how much weight, if any, I have gained. I started at 158 lbs and this morning I clocked in at 160.6…a reasonable gain if you ask me. With the good weather coming around my other passion, mountain biking, should help to keep any further gain in check. Now off to beer #100. Beer #100 is a brew from the state I call home, New Jersey. 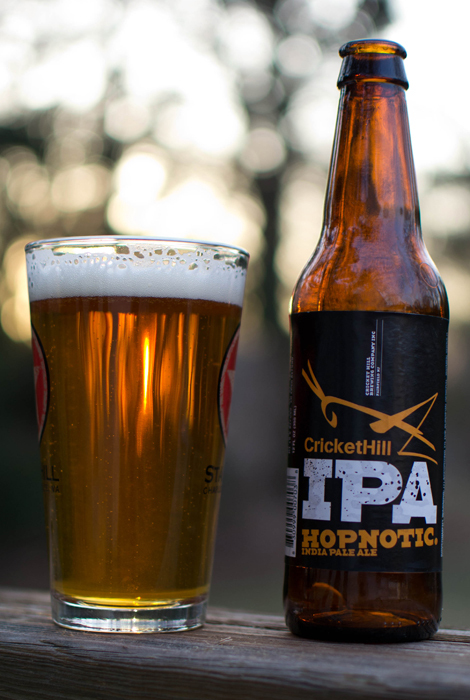 Hopnotic India Pale Ale is brewed by Cricket Hill Brewing Company. This English IPA has an ABV of 5.2%. To the pour we go and a clear amber liquid filled my pint glass. A white foamy head, about a finger width in size, quickly disappeared but it left some decent lacing in its wake. The nose was a bit on the weak side with some caramel malts and a grassy, sort of citrus hoppy aroma. I took a sip and those familiar pine tastes from the hops hit me first. The malts followed up with a bread or biscuit type flavor. It finished a bit sweet and a bit bitter. The mouthfeel was that of a medium bodied drink with a bit of carbonation. This beer was very easy to drink. Overall it was a decent showing for my 100th beer. Not spectacular but also not horrible. Based on this, I think I will have to try some of Cricket Hills other offerings. Cheers! Only 265 more beers to go!